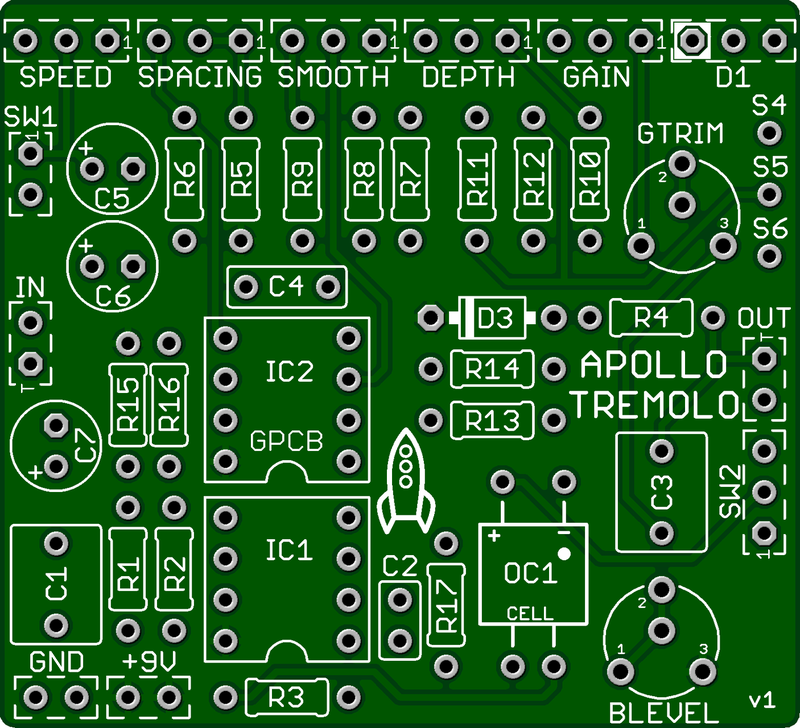 This kit includes all of the parts needed to build the Apollo Tremolo GuitarPCB project. The Apollo Tremolo is a highly advanced version of one of the most popular music effects ever made! We took the original Tremulus Lune version to a new advanced level by adding several versatile features! Additions include an instantaneous SPEED SHIFT for a dramatic change and a KILL switch to remove the effect while maintaining a high quality buffered throughput. The awesome buffer makes this a 2 for 1 pedal . This is arguably the best DIY tremolo on the market because it sounds wonderful, has extensive controls. The kit includes 3 foot-switches: 1 for SPEED SHIFT, 1 for KILL (buffer only), and one for True-Bypass. The kit includes a 1590BB enclosure and black Davies 1900H-style knobs. This is an intermediate project and is not recommended for first-time builders. All of our kits include a jack for a DC power adapter but no battery snap. If you wish to add a battery snap, please add a battery snap kit to your cart in addition to the pedal kit, however, please note that it will be difficult to fit a battery into our pre-drilled enclosure on this build. Please see what is provided in a kit? in our FAQ for more details of what is included and what you will need to provide to complete the project. Check out this Apollo Tremolo Video Demo by Barry at GuitarPCB!